The BOA is nearing the end of our Centennial year and reflecting on 100 years of developments in orthopaedic surgery. While innovation in surgical techniques has dramatically improved patient care, the changing nature of healthcare delivery systems, rationing and access to care mean that many patients are still struggling with the day-to-day impact of MSK conditions. During our Congress last week we heard powerful stories from patients on the impact of waiting for surgery. From a patient waiting for carpal tunnel release who was struggling to deal with basic daily tasks such as handling money, preparing food or getting dressed to another describing his wait for knee surgery, in huge amounts of pain with increasingly reduced mobility impacting on overall fitness and the ability to enjoy life. It is undoubtedly a challenging time for MSK patients in the NHS. There is chronic under supply of resources for NHS services, and huge increases in the numbers of people waiting longer for surgery in many parts of the UK. In April this year we issued a press statement to highlight the situation in England, and shockingly, at the time of the release, there were still some trusts that had not resumed elective operations after the winter moratorium. The number of people who had waited over 18 weeks was at its highest level for many years and the graph below shows that this has been progressively deteriorating for several years (source: Waiting times data). 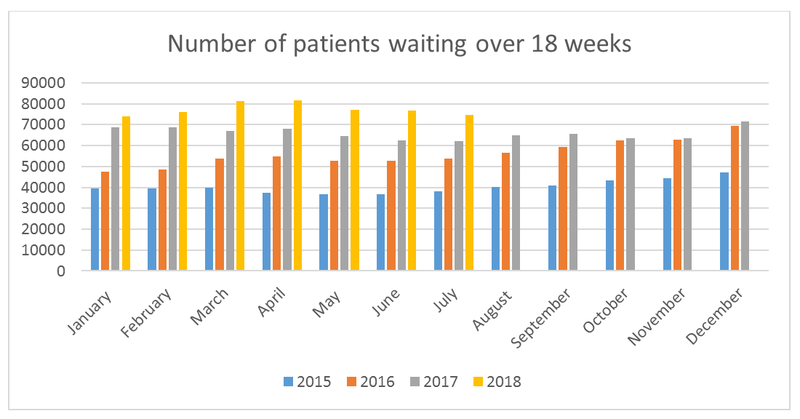 The number of people waiting over a year has also increased markedly in England, while the situation in Northern Ireland is even more stark, and we are speaking to the Chief Medical Officer there about this next month (see graphs below – source: Waiting times data). The number of people in England waiting over a year for T&O surgery reached a high of 978 in June 2018, which compared to 375 a year earlier (a 260% increase). The number of people waiting more than 18 weeks reached a peak of 81,663 in April 2018; the highest level since reporting began November 2010. A BOA survey of hospitals in England received 84 replies from BOA Link people and 31 % of these had experienced winter closures of 3 months or more. These delays have also had a major impact on orthopaedic trainees, who are losing opportunities to learn. This impacts the future workforce and is a situation we are continuing to monitor closely. At our Congress we discussed access to Elective Care in further detail. The HSJ recently reported our concerns about Sussex CCGs policies that patients for hip surgery meet the requirement of: “uncontrolled, intense, persistent pain resulting in a substantial impact on quality of life … which have failed a reasonable period of conservative treatment of at least 6 months.” (HSJ article) We highlighted the BMJ coverage of growing numbers of Individual Funding Requests for hip and knee replacement as a result of more restrictive CCG policies. (BMJ article). During the year we’ve done as much as we could to get our messages out to the media and speak out on behalf of our patients about the restrictions on access to care. Besides the articles above, have received coverage in the Telegraph, Times, and Daily Mail among others. We are making plans to develop relationships with key decision makers, both through ARMA, but also directly. 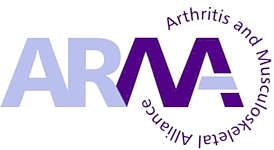 We also continue to promote and highlight the joint position statement from ARMA. Most recently we have been working with four specialist societies (BESS, BSSH, BASS and BASK*) to respond to the latest attempt to limit seven orthopaedic operations through the Evidence Based Interventions consultation. 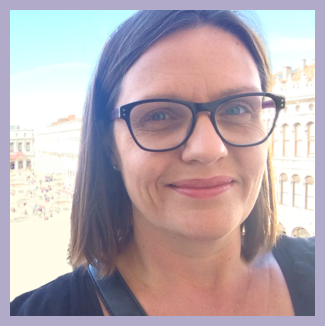 We as a profession agree that there are some operations where this is appropriate, but for others we have raised issues about the proposals, the consultation and the data it is based on. Our full response was posted online last week, here in our News section. The BOA is very aware that our concerns are shared right across the ARMA community and are pleased to be part of this alliance, working together to shine a light on these important issues as part of our continued commitment to be “Caring for Patients, Supporting Surgeons”.